Got something to celebrate? 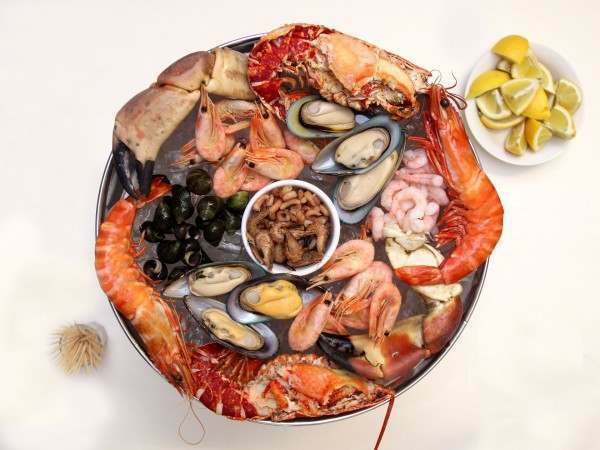 Do it in style with our plat des fruits de mer, which contains eight kinds of shellfish including lobster, mussels, prawns, crab, winkles and brown shrimps. The basic pack is very easy to deal with as everything is already cooked - you only need to defrost it and arrange it on a pile of ice. If you’d like our full rundown on how to make a success of this famous dish, it’s right here. If you would like to add other kinds of shellfish, the favourite candidates are here. We also sell a stainless steel bowl and stand. Related links to "Plat des fruits de mer"
Cooked lobster (min 270g), whole crab claws (min 300g), Atlantic whole prawns (150g), crevettes (prawns) (min 110g), Atlantic peeled prawns (100g), peeled brown shrimps (100g), half-shell mussels (6), winkles (20), whole brown shrimps (30).